Being MIA has instilled within me a rushed urge to pen down (or type out, rather) some sort of spilling from my head, my memory, my any form of past experience or happening. Just anything. A deep urge to merely engage in some good outpouring. So I thought, why not talk about the book I just finished, or perhaps my first week at school (which was more fun that what I had initially playing out in my head, with a ton of dirt and soap and ruggedness and hearty laughter). Then I thought, hey, there’s that food post I missed out on. So I opted for a missed call rather than something relevant to my own present. I’m absurd and boring that way, yes. Basically, this is the restaurant I went to a few days before I left for France for a food and ski escapade, one which whom everyone probably already knows about. Pique Nique. Literally pronounced picnic, quite unlike what I had in my head whenever I walked by the new place a few years ago, my uvula ringing from a post French word half horse grunt. 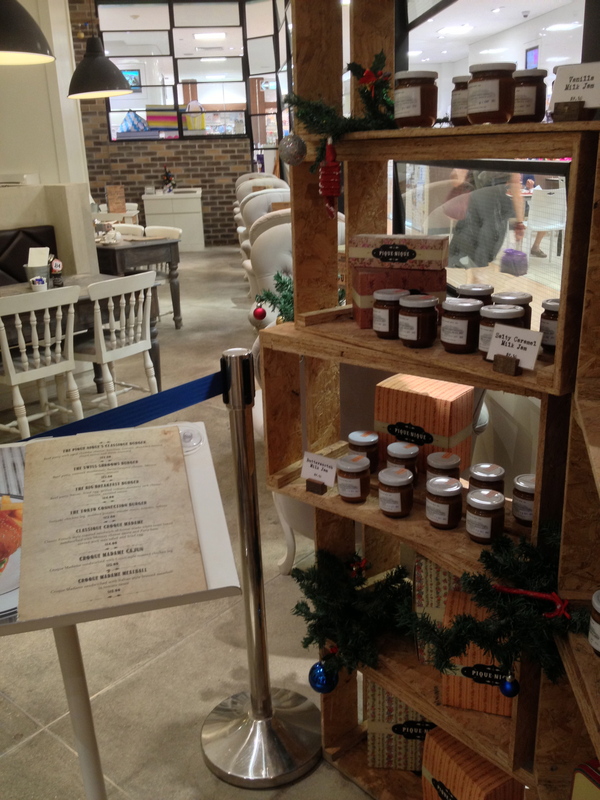 It’s in an open area where everyone can admire their collection of whoopie pies and blueberry cheesecakes. A quirky little space which I believe replaced Mcdonalds or something or another, though the genuine quirky factor is dimmed down by the somewhat unprofessional gimmick of service; slow and amateur to say with full politeness. The burnt-coloured chairs look heavily inviting. 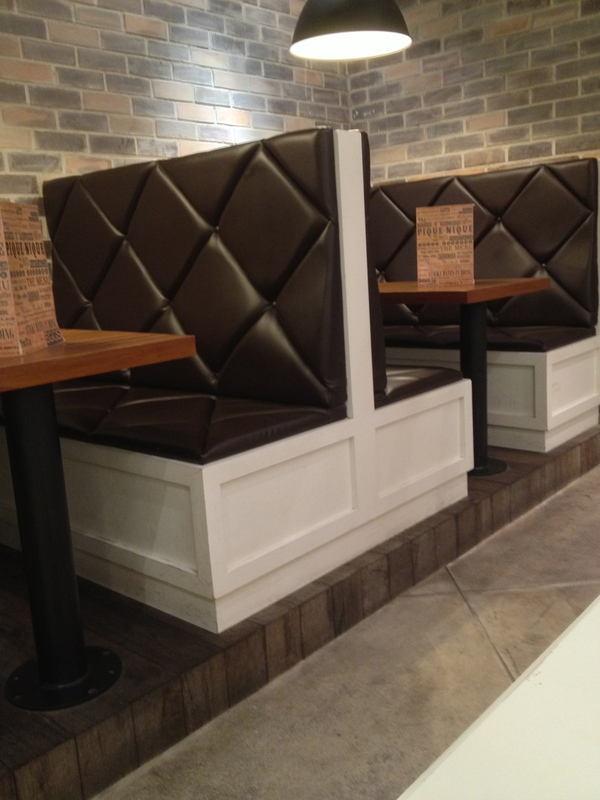 Plush exterior to mislead the eye, for once one sits down, you are brought back to a 1950s red bar booth with a cheap plastic cover. Very homely and chic, though. 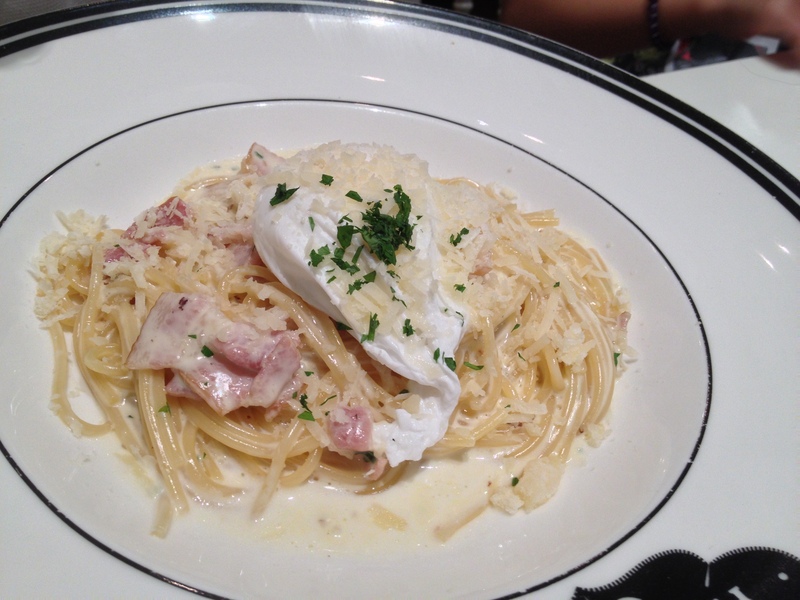 I believe there is a mighty correlation between a person’s age and his/her attraction to a dish such as carbonara. I remember as a child I would happily wolf down a full plate of this after school, made lush and complete with lashings of Thai sweet chill sauce, since I believed it cut through the opaqueness of such a thick white swimming pool and made the crisp bacon bits even more distinct. Now I watch my two youngest sisters ordering the stuff whenever available in a restaurant. It’s always the cream pasta and meat which appeals to the palette, though I myself fail to keep up with childhood memories and have stopped ordering it altogether. Call me what you may, but I’m certainly not the sort to order the same thing over and over again at different restaurants, for fear that the lack of variety may one day end up killing the sentience of my taste buds and whatever there may be present to provide me with the ability to distinguish between flavours. It’s mostly fear, and a little boredom. Stole a bite from my dear cousin’s plate just to be sure that they weren’t serving it for the sake of Western tradition. A good sauce and slightly overcooked pasta. Tasty, albeit predictable. And the predictable stuff is only half worth it, oui? I actually found the most interesting thing the salad, which was really well dressed, and had the correct components of everything in a delectable ratio. I was guessing that the salmon might be a tad too salty, and indeed it was. I sound incredibly cynical and snarky. To guess and be correct is a satisfying feeling, since it offers peace of mind and less hefty an emotional price. However this case presents a more disappointing sort of correctness, hence the satisfaction is not achieved. The egg was sufficiently poached, but it was the sort of dish which made you wonder if good quality would be maintained time and time again, long after the hype diminishes and the spotted teenage waiters move on. The thing I was most disappointed about was the terrible lack of drinks available. We perused the menu and ordered iced chocolate and iced lattes, only to find out that ‘none were available’. None. The word cut me up on the inside. We were forced to resort to tea, water and coffee. Oh yes, and a glass of apple juice (the sort which you could taste the carton brand of). Of course it had to be our fault for coming to eat on the wrong day at the wrong time with the wrong expectations. The disappointment almost turned to enragement, but I kept my hat on and merely scowled for a few seconds. It’s not the end of the world. So. My dish. I saw the fried egg of course. That sort of said quite enough once I opened the coffee-dipped menu. 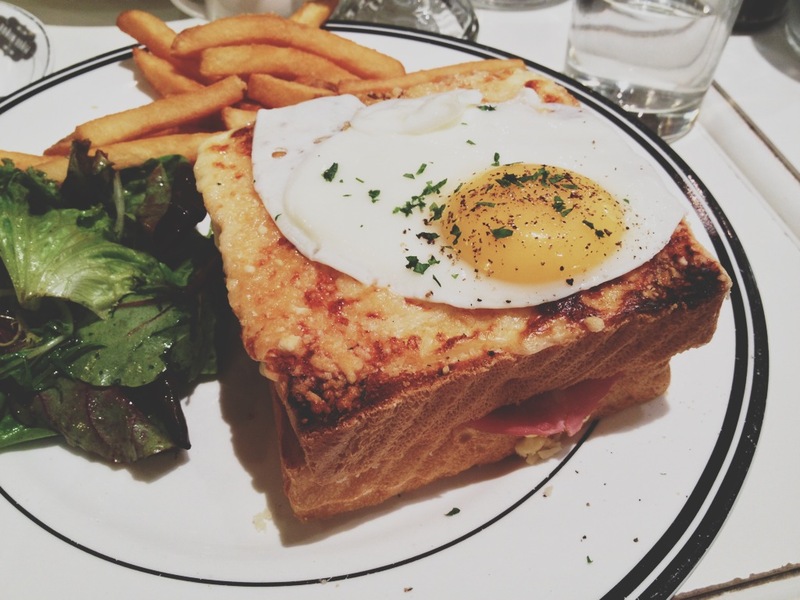 I’ve tried Croque Madame a good few times; enough to tell whether something of this profound size would behold enough taste to prove it’s worth. Plainly saying, it was overwhelmingly bready. I was forced to cut through rounds of dry white bread, with each piece failing to soak up enough eggy goodness. It’s all about the yolk, but the gargantuan portion of cheesy bread was putting me off. Cheese was present; all lovely and crusty and sometimes even gooey between the two-inch thick slices. The only wrong thing was the disproportionate ratio. Portion= utterly westernised. Not entirely a bad thing, but evidently it was perhaps too much of a normal thing. Nothing to blow my (non-existent) socks off. These cases present to me something more unattractive than appetising, even if I was absolutely ravenous. And here you may admire the luscious serving of crusty Belgian waffles which I recommended to my overwhelmed 5-year old sister, since I am a selfish human being and wanted to have a few bites myself. One of the better waffles out there, which don’t rapidly melt away into a soggy mess with something like ice cream and whipped cream on top. Each bite was wonderful, and the ice cream itself wasn’t full of that artificial, Hersheys-esque aftertaste. A half-real chocolate taste, which was impressive considering the decent price. The ratio in this case was spot on. The ice cream could coat the whole thing with an ample, plump brown blanket, creamy and nourishing. 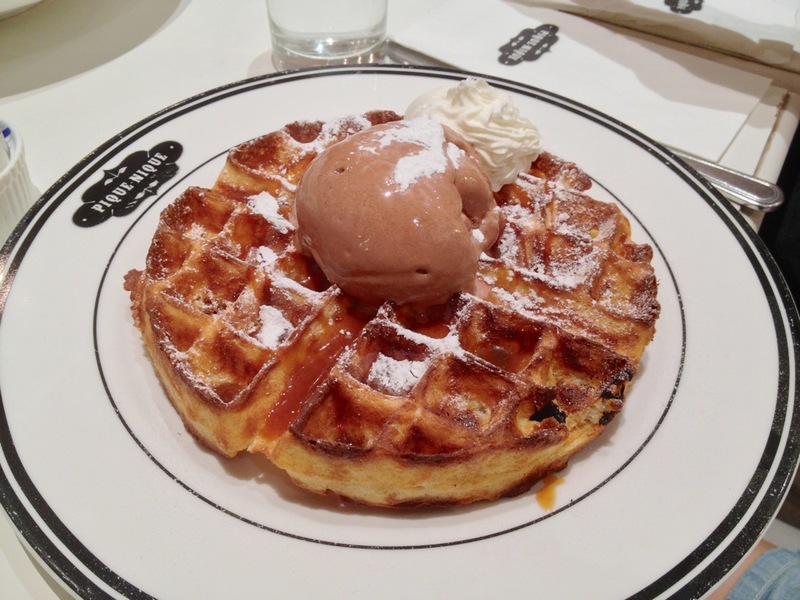 Waffles were simply spectacular, what with the golden edges and crunch throughout its ridged, pressed body. The chocolate was just asking to be sploshed into every square cubby hole, lying there to soften and sweeten a hardy bread texture.